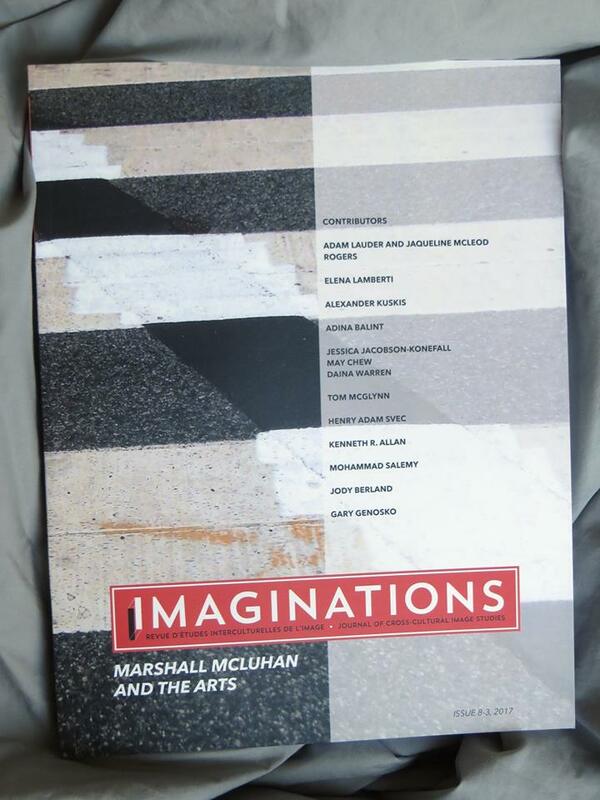 The online publication of the journal Imaginations 8-3: Special Issue on Marshall McLuhan & the Arts was announced on this blog in December of last year. See https://goo.gl/Y5RtNZ. Here is a note from co-editor of this issue Adam Lauder: [I am] delighted to finally share the print version of the special issue of ‘Imaginations’ co-edited by Dr. Jaqueline McLeod Rogers and myself, on the theme of “McLuhan and the arts,” with fantastic contributions by Mohammad Salemy, Elena Lamberti, Jody Berland, Tom McGlynn, Alexander Kuskis, Jessica Jacobson-Konefall / May Chew / Daina Warren, Henry Svec, Adina Balint, Gary Genosko, and Kenneth Allan; beautifully printed in full colour by Friesens in Winnipeg …many thanks to Editor-in-Chief Sheena Wilson and the team at Imaginations for hosting and facilitating this project, especially Managing Editor Brent Ryan Bellamy for his unflagging support of every stage of the rigorous review and production processes, as well as copy editor Shama Rangwala and French translator and copy editor Ève Robidoux-Descary. Thank you to Jaqueline, whose concept this special issue was, for inviting me to collaborate, and for giving me space to “experiment” in our Introduction. Additional special thanks to Kari McCluskey at the University of Winnipeg and Dr. Markus Reisenleitner (York University, and incoming Editor-in-Chief of Imaginations). This special issue exploring “Marshall McLuhan and the arts” encourages new approaches to the study of McLuhan’s influential theses on perception, design, and the built environment as well as the artist’s changing role in postindustrial society. Submissions try to excavate previously unknown, or lesser-known, narratives and linkages, and/or engage contemporary resonances and possibilities for intersection with current critical theories and debates. The cost is $30 for the first copy and $25 for additional copies. 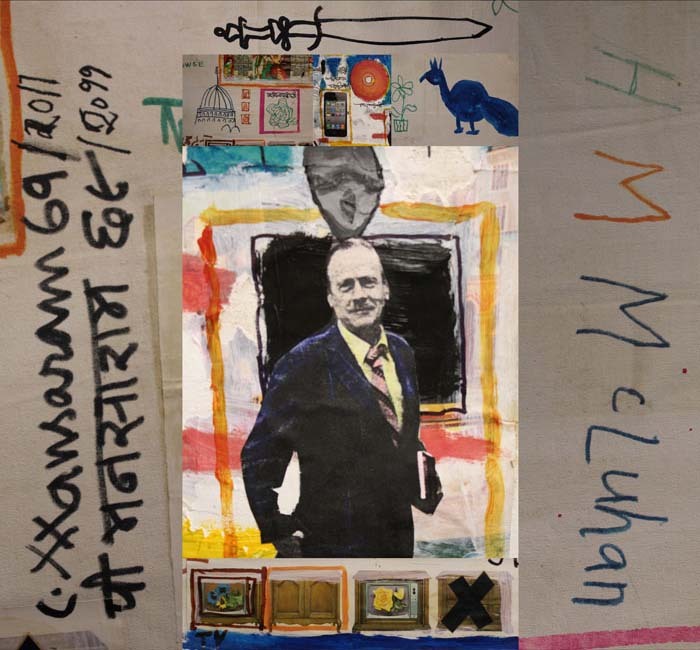 A cropped portion of a collage created by Indo-Canadian artist Panchal Mansaram who prefers to be called Mansaram with the collaboration of Marshall McLuhan that includes a photo of the latter taken by Mansaram (1969, with new elements added in 2011).